Whether you're celebrating your friend's bachelorette or plotting a romantic date night, you don’t have to give up on fun just because you’ve given up on alcohol. The very experience of being pregnant is (mostly) a happy one, especially when you're expecting your first child. From that candid, excited moment when you share the news with the father-to-be, to finally feeling your baby kick inside your tummy or hear his heartbeat, those nine months are full of mini celebrations. 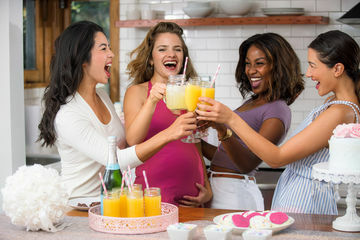 But while getting tipsy on a glass of bubbly or two isn't an option for you when you're expecting, there are plenty of booze-free ways to get pumped for your husband's birthday, your bestie's big promotion, your favorite holiday, or anything else that deserves a party. 1. Indulge in your favorite food. In the past, you may have been busy mixing cocktails and shimmying into your most flattering little black dress for a special occasion, which might make you feel a tad depressed thinking about the elastic waistband you'd have to add to, well, every outfit you own. The good news? Being pregnant gives you full permission to eat whatever you freakin' want. We bet your mate won't mind if you suggest splitting a ridiculously cheesy pizza or making pasta from scratch as a great way to celebrate. Depending on what trimester you're currently bumping your way through, it might be wishful thinking that you'd be able to make it all night out partying for your pal's birthday. (Or even 9 p.m., if we're being honest here.) So why not suggest a next-day brunch for your crew? You can even host (fingers crossed morning sickness has bid adieu) since you'll be well-rested, and those you love will appreciate the deliciousness. 3. Change your mindset about drinking. You might be daydreaming about those days when Friday meant Netflix and chilling with a bottle of your fave vino, but accentuate the positive of your new, alcohol-free existence. Think about the hangover you definitely won't have, or the money you saved (and you need it with your pending arrival!). And go ahead and splurge on something really fun for you to imbibe—fresh fruit and yogurt for a killer smoothie, that fancy fresh-squeezed juice, or the ingredients for a really fun mocktail. 4. Snuggle with your mate. Before there was even the thought of a baby, there was that person that you fell in love with and married. Remember? While your significant other's greatest gift to you lately is rubbing out the kinks in your feet and back or reassuring you that no, you don't look incredibly bloated and gross, that's the person you decided to spend your life with and start a family with. Before the baby makes your party of two a bit larger, savor the last few months you have together, just the two of you. Make a dish you both like (and one your pregnant self can stomach) and talk about anything that makes you happy and excited for all that's to come, and all you've created. 5. Take a spa weekend. It's no easy task carrying a growing babe around for nine months. It not only takes a toll on your body, but completely shapes your hormones and well, let's be honest, isn't always the most enjoyable experience. Instead of worrying about finding a dress big enough to fit or conceal your bump or trying to dodge questions from strangers or family members, grab a girlfriend or your guy and head to the spa. Many luxe resorts or spas have year-round specials (and special prenatal treatments) that encourage you to celebrate your happy news with a totally relaxed attitude—and can help you deal with the aches and pains that come in those last few months. And hey, maybe that breathing during your prenatal massage will prepare you for childbirth? Mmm. Maybe. 6. Exercise your right to say "no, thanks." One of the perks of being pregnant: No one will bat an eyelash if you bow out of something, because you're carrying precious cargo. So if someone is headed to a rave party, or a super-boozy brunch that won't be fun super-sober? Don't be afraid to say "no, thanks!" and send a card or a small gift instead. Your pal probably won't mind and will be touched that you were thoughtful enough to be there—in some way—for their joyous moment.